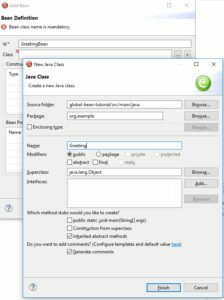 This tutorial shows how to create a customizable service that uses a global Java bean and Camel XML. 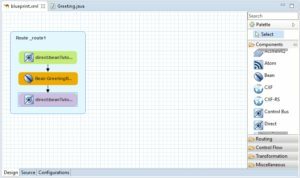 By the end, you will have a simple Fuse integration project, which includes a Camel test that verifies the bean logic. 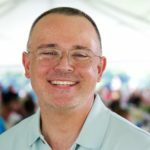 Create a Fuse integration project. Create a bean in the project. Prerequisites: Eclipse Oxygen is required. During installation of Red Hat Developer Studio 11.0, you should have selected installation of JBoss Fuse Tooling. First, we have to create a project for where we can put our code. In the Developer Studio menu bar, click File->New->Fuse Integration Project. 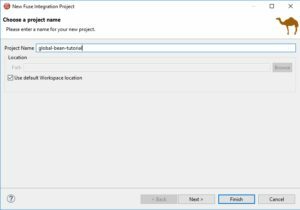 In the new project wizard, in the Project Name field, enter global-bean-tutorial. Accept all defaults to create a new, empty Fuse project. Fuse tooling will then build a new Blueprint Camel project, which can take a few moments. In the route editor, click the Configurations tab and then click Add. In the “Create new global element…” dialog, click Bean and then click OK. In the “Add Bean” dialog, in the Id field, enter GreetingBean. To the right of the Class field, click the + button to create a new class. In the Package field, enter org.example. In the Name field, enter Greeting. In the “Add Bean” dialog, click Finish. Attaches a greeting string to the beginning of the method argument. The hello(String) method provides a way to customize the greeting in the constructor and to retrieve the cache. A Camel route can use these various points of entry into the bean code. In the route editor, click the Design tab. In the Palette, under Components, click and drag Direct onto the Route_route1 container. This tutorial uses the Direct component to keep the example simple. You can, of course, use a File component, JMS component, or some other component. In the Uri field, change the value to direct:beanTutorial. In the Palette, under Components, click and drag the Bean component onto the direct component. In the Ref field, display the dropdown list. Select the GreetingBean, which appears here because you previously added it as a global bean. This creates a reference to the global bean and inserts it into the route. In the Palette, drag another Direct component onto the Bean in the route. In the Uri field, change the value to direct:beanTutorialOut. This creates the final destination for the route. In the Project Explorer view, in the src folder, create a new folder named test. In the test folder, create a new folder named java. In the Developer Studio menu bar, select File -> New -> Camel Test Case. Make sure the Source Folder path is global-bean-tutorial/src/test/java. To the right of the Camel XML file under test field, click Browse. Select the blueprint.xml file and click OK. In the Name field, enter GreetingTest. The Camel Test Case wizard generates a test class that extends CamelBlueprintTestSupport and provides some templated code. 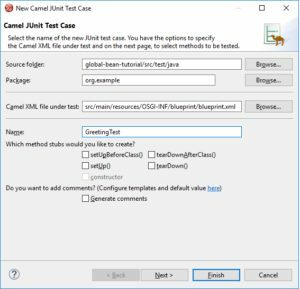 To finish the generated test, provide some sample input and output messages and then send them to the project’s Camel route. With these changes in place, in the Project Explorer view, right-click the GreetingTest class and select Run As -> JUnit Test. Your test should pass. Update the route to be more specific about which bean method to call. Customize the greeting by passing a constructor argument. Update the test according to the route and bean updates. Click here to for an overview of Red Hat JBoss Fuse a lightweight and modular integration platform.